Once again I find myself at home, this time for over a month, which to me seems like such a luxury (and not just ‘cause I’m not living out of a suitcase for once). I really love being home in Perth at this time of the year too. The seasons are changing from winter to spring and so each day feels different. One may be cold and rainy, the next warm and calm. The mornings seem to have less of a bite to them as the sunshine cuts through the cool air, although staying snuggled up in bed is still so tempting. Home isn’t so bad now, is it? To celebrate the launch of the new CLUSE La Garçonne collection (we all know how obsessed I am with my gold one!) 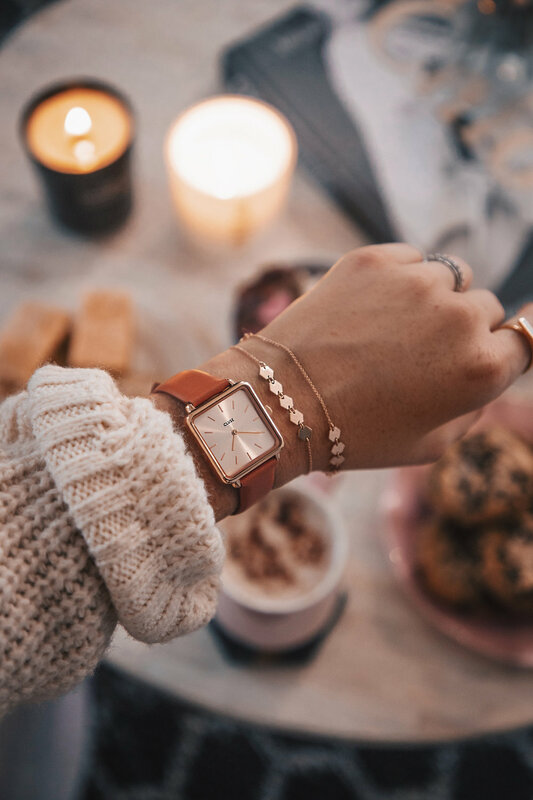 and, in particular, the one that makes me want to get cosy, drink hot cocoa and enjoy an evening in – none other than the Butterscotch La Garçonne [swoon] with its rose gold casing and soft tan leather strap – I’m sharing with you the eight things I miss when I’m away from home. And no, I’m not just talking about my collection of fabulous CLUSE watches. Let’s be honest, they travel with me. No surprises that this one comes up as my number one. Oh, how I could never take moments like these for granted. After we got married, everyone was asking us where and when we’re going on our honeymoon, and my response was always the same; a week on the couch with our good friend Netflix. I was joking, kinda’. 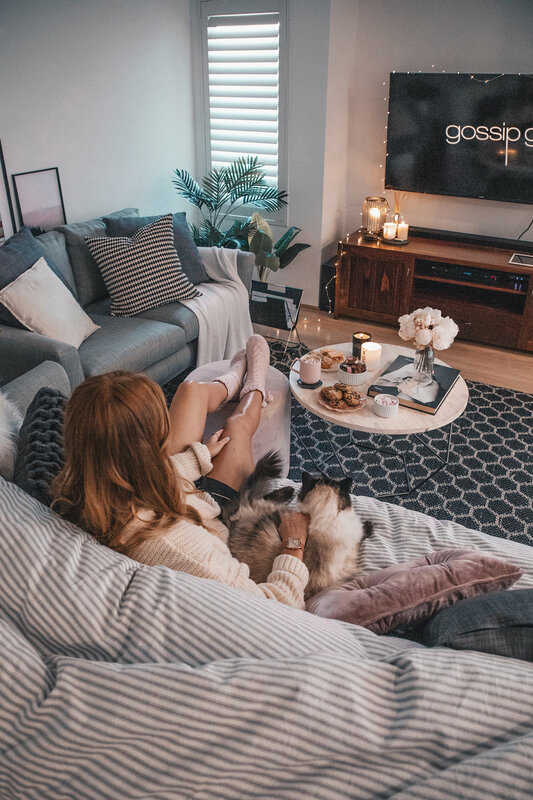 Honestly though, it feels like such a luxury to be able to spend an evening on the couch doing nothing but enjoying the latest flick (or in my case, rewatching Gossip Girl). As soon as we were settled, I really made a special night of it too; candles, fairy lights, snacks (duh), our big warm blanket and a whole season of GG. Doesn’t get much better than that, now does it? Unless we’re somewhere in Asia, I miss home cooking so very much. Not only does it not cost and arm and a leg (worst thing about eating out), but a home cooked meal just tastes so good. It tastes like home. To be fair, my favourite dishes are generally Asian cuisine of some sort, from ramen and sashimi to congee and Singapore noodles, you can probably bet that this is what we’re cooking at home most of the time. What can I say? It’s all I ever crave – just ask Brad! I don’t think I can count the times we’ve spent 2.5 hours preparing our favourite chicken congee dish after flying half way across the world. Oops! Oh, my little fluff ball! How I miss her when we’re not together! Even though I know she’s much loved when we’re away (and spoilt rotten, let’s be real here), being at home with our rag doll cat is just the best thing ever. Home just isn’t home without her little sassy presence around. When she became part of our family over five years ago, we never expected to travel so much, but she really does make it that much harder to leave. I love being at home for so many reasons, but this is by far the most important one. CLUSE La Garçonne watch in Butterscotch, CLUSE necklaces, bracelets and rings, ASOS knit jumper, Homebodii pyjama shorts and Bras N Things knit socks. I really don’t know how I get anything done when we’re travelling from place to place, constantly packing and unpacking, sleeping on planes and trains, discovering new cities and trying desperately to run a business. It really takes it out of you, so kudos to those that do it full-time, non-stop. The first thing Brad and I do when we get back, aside from the dozen loads of washing, is establish a daily routine. Wake-up at 5:30AM, reply to emails, drink coffee, eat breakfast and so on. Not only does it help us get back to normality, it also means we’re able to make the most of the time we’re home by being ultra productive, ticking off our to-do list and living a healthy lifestyle. There’s nothing quite like the feeling of walking over the sand dunes to be greeted by the roaring blue ocean below. I’ve spent my whole life by the sea; camping on the beach, cruising in Dad’s boat, making epic sand castles and playing in the waves. They were some of my fondest memories as a kid, so it’s so surprise that as an adult, anywhere by the ocean at home is my ‘happy place’. I just feel so calm, so rejuvenated, so refreshed every time I see it, even if it’s still far too cold to go in the water. As much as hotel beds are nice, they could never be as comfy as your own simply because they’re not at home. There’s always a sigh of relief whenever we get back, climb into bed and feel our own cosiness around us. Yes, the jet lag and 24-hour travel time may have something to do with it, but that feeling never ever gets old. Even now as I type this, I’m cuddled up in bed and it’s just too good! Is it strange that I really miss lighting candles when I’m away? Once upon a time, not that long ago, I never ever used to light the candles around my home because I didn’t want to waste them. And then I realised, what’s the point in having them if I don’t actually enjoy their light flickering and scent wafting? So, now I do it as much as I please. Plus, it’s kind of satisfying when you hit the end of the wick. While I can’t light a candle when we’re abroad, I do sometimes treat myself to a bouquet of flowers to make our hotel room feel a little more homely. It’s those little touched, you know? I can’t quite explain it, but it’s a feeling many of us know. It’s that euphoria that overwhelms me when I touch down at home after a day, a week, a month away. It’s the anticipation when I’m just a block away from our house. It’s walking in through my front door and being greeted by those familiar smells of home. It’s cuddles with Indi. It’s laying down on the couch. It’s jumping into my own bed. It’s waking up and feeling the friendly morning light hit my face. It’s a feeling I love and crave and need.